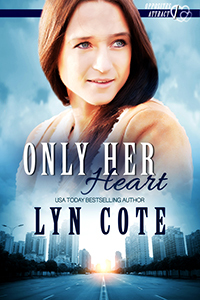 Sweet Romance Reads: Lyn Cote Asks Do Opposites Truly Attract? My new book, Only Her Heart, starts a series titled: “Opposites Attract.” So that kicks off this question–Do you think that’s true?In Only Her Heart, Annie and Jack are true opposites. Here’s the tagline for the book.What will it take for a clueless computer genius to notice the loving woman at the desk beside him? And the tagline for the series: Four unlikely couples find opposites do attract even in the shadow of mystery~Do you know a couple that are obviously in this category–opposites? I do. In fact, my husband and I are the prototypes for the well-organized take-charge woman of words and the quiet man who thinks in numbers. No one would have put us together, and we have celebrated over thirty years together. To learn more or purchase, click this link. Great post, Lyn. Yes, opposites do attract. In my case, I'm much like you, a woman of words, while my husband is an accountant. :-) Great to have dh do the numbers-especially at tax time! My husband and I are opposites. He grew up in a city in Africa. I grew up in a small upstate NY town. He was an introvert and me the go getter, in the beginning. Now that has flipped. But we are working on our business together and we complement each other. That's a big different! True love works!! I believe they can. They can compliment each other. In some ways, my husband and I are opposites. He's definitely organized, and I have a hard time with that skill. Although my husband and I are opposites in some ways were are similar in others. I’m a word person/writer, he’s a numbers person, but we are both musicians and we both love books—just not the same genres. My husband is an out-going, very social guy. I'm happiest with a good book. He loves music, both to listen to and to play. I prefer quiet. But, we're still crazy about each other after 34 years of marriage. I think opposites do attract and can live a wonderful life together. My husband and I are opposites. I fill in his gaps and he fills in mine. We end up making a great team. Thank you for the thoughtful post, Lyn. Best of luck with your new series!